If you think trapping yourself is going to make me stop testing, you're sorely mistaken; here's another cube. Cubes are common testing elements throughout the Portal series. They are commonly used to press Buttons, disable Turrets, or redirect Lasers. The Weighted Storage Cube was first introduced in Portal, and remains prevalent in Portal 2. In Portal 2 however, the cube is given a blue ring in the center instead of a blue cross, and can turn yellow when placed upon a Super Button. The Weighted Companion Cube was first introduced in Portal, and remains prevalent in Portal 2. 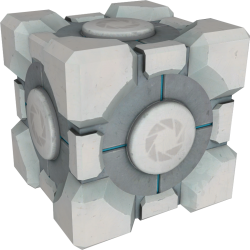 Similar to the Weighted Storage Cube, the Companion Cube possesses a different design in Portal 2. The Cube functions in the same way as a Weighted Storage Cube, being differentiated to encourage test subjects to feel attached to the Cube. A feature to the new Companion Cube in Portal 2 is that it is able to sing. The Edgeless Safety Cube was officially introduced in Portal 2, where it is used only in the co-op campaign. However, it also appears once in the single-player campaign as garbage. The entire name is given out of irony, however it still retains the coloring scheme and patterns present in the designs of the other cubes. The Edgeless Safety Cube did have an appearance in a Portal Challenge Map and a Portal: Still Alive Map, however it did not have a notable name and also did not have an accompanying receptacle, thus is not widely considered to have its first appearance until Portal 2. This Item appears in Chapter 2 chamber 6, while GLaDOS is cleaning out the cube dispenser, where 2 of them fall out amongst other garbage. The Discouragement Redirection Cube was introduced in Portal 2. Its main purpose is to redirect the Thermal Discouragement Beam to other places or through portals if necessary. However, the cube has a second use as a Weighted Storage Cube, as it can be used to activate the Heavy-Duty Super Button. Frankenturrets are bizarre Sentry Turret-Weighted Storage Cube hybrids created by Wheatley in order to complete test chambers when he had no test subjects. They are present in the single-player chapters, The Itch and The Part Where He Kills You. Frankenturrets do not speak, and instead emits incomprehensible chirping sounds. They act as Wheatley's replacement for Storage Cubes, but their behavior is different. Frankenturrets will hop around aimlessly while not placed on a button. When picked up by Chell, they retract their legs inside their cubes. If they fall over on their sides or upside down, they will wave their legs trying to get up. The Scalable Cube is exclusively featured in the Portal 2 Sixense DLC Test Chambers. The only way to scale the Cube is with the Razer Hydra Controllers, a feature supported by the Portal Gun in the DLC. The size of the Cube changes simultaneously with its mass. The Scalable Cube can be used to build bridges between gaps or to crush Turrets. The Contraption Cube is exclusively featured in the Portal 2 - Education Version Puzzle Creator. It has adjustable mass, friction and elasticity. The minimum mass is 1kg, maximum mass is 85kg. There are 5 levels for friction: frictionless, slippery, normal, sticky and very sticky. There are also 5 levels for elasticity: no rebound, slight rebound, normal, bouncy, very bouncy. The default settings for the Contraption Cube are 40kg, frictionless, and no rebound. Different settings cause the cube to take on slightly different appearances. Connections: This item supports inputs, which drop the cube when activated and fizzle the previous cube (therefore this is only present when the dropper is enabled). Connect to... is used to connect this item to another, via inputs or outputs. Connection visibility controls the visibility of this connection, and Remove connections is used to remove existing connections. Cube Type: Allows switching between Standard, Companion, Reflection, Sphere and Franken cubes. In the education edition, it also allows switching to the Contraption Cube. A spherical replacement seen in an advanced chamber. Unused "skull" cube found in the files of Portal: Still Alive. A Weighted Storage Cube covered in Repulsion Gel. A Weighted Storage Cube covered in Propulsion Gel. This page was last modified on 9 February 2018, at 00:58.